As the Austrian-born American management consultant Peter Drucker once said, "What gets measured gets managed." When Eric Schmidt visited the Harvard Kennedy School last spring, everyone listened. Insights from the Executive Chairman of Google were in such high demand that students filled all three levels of the auditorium. 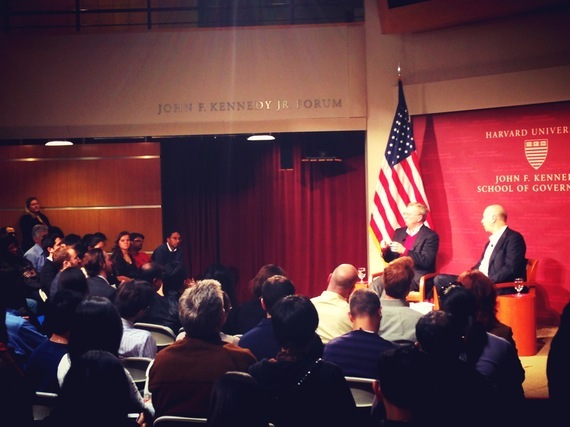 The talk hosted by the Institute of Politics in the JFK Jr. Forum and moderated by David Gergen touched upon the topics of leadership, innovation, and entrepreneurship. For Kennedy School students, who often work at the intersection of public and private affairs, the issues he raised on philanthropy were particularly important. "The thing I would tell you about nonprofits is that they're full of extremely well-meaning people who need to build things," he began, "There's so much waste in the philanthropic world because they don't measure their outcomes." Schmidt was worried that leaders of nonprofit organizations are often unable to answer simple questions that relate to the quantitative impact. He added that learning to use analytical skills to measure and solve problems is an essential life skill, which major universities often neglect to teach students. In particular, the problem that Schmidt recognized in the philanthropic world is poor management. There is a lot of good intention, but the impact does not match the intention. Think of all the people that devote their resources and time to issues they care about. We need to do better to make sure that those people are equipped to translate their intention into impact. Fortunately, there are few nonprofits that provide teachable lessons. Adam Braun, founder of Pencils of Promise, proposes that nonprofits need to stop apologizing by default. Instead of calling themselves nonprofits, they should call themselves for-purpose organizations. Braun suggests that profits and purpose do not have to be separated. "The rise of social entrepreneurship that we're seeing right now is the most promising way in which profitable purpose can become the norm," Braun told attendees of the 2011 Google Zeitgeist. Reframing the way others perceive nonprofits does not guarantee good management. But it will get management thinking about their purpose. Thinking about your purpose is the first step to measure an organization's outcome. It is the yardstick against which everything else is measured. Nonprofits are not subject to the same market discipline that shareholders provide to for-profit companies. Any company, and particularly those that want to be listed public companies are scrutinized closely and need to adhere to certain requirements. For nonprofits, we need to begin a debate about how we can effectively find norms and standards that govern nonprofits in such a way that they have improved management. For me, there is no reason why nonprofits should not be under the same discipline as publicly listed companies. Perhaps the first step for Kennedy School students is to take a class at Harvard Business School. What's more, let's make it an integral part of our own curriculum to do so. One course can go a long way. When more people start to measure their outcomes like Adam Braun, we will be on the right track. Otherwise, intention will not get translated into impact. Since 2007, Bill Gates has saved 6 million lives. What have you done? This was originally published at The Citizen, the student newspaper of the Harvard Kennedy School.